Once your students have completed Peer Review work, you can check the feedback they gave and give them feedback of your own. This guide is on checking peer reviewed work. If you want to know how to set Peer Review work for your students, we have an article here on how to do that. 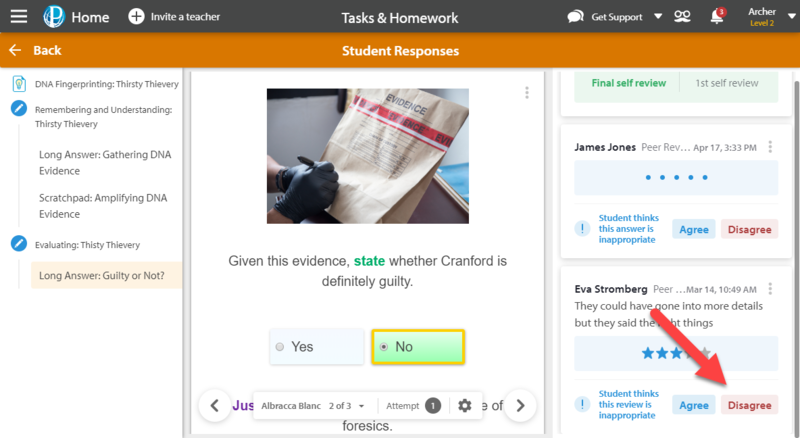 Navigate to the task by either clicking on a notification (you'll only have one if there is work for you to check) or by going through the Tasks & Homework section of your Control Panel, opening the Responses section of the task. When there are new reviews for you to check, they'll appear under the notification bell at the top-right of the screen. You'll be given the option of either viewing the answers by student or by question. 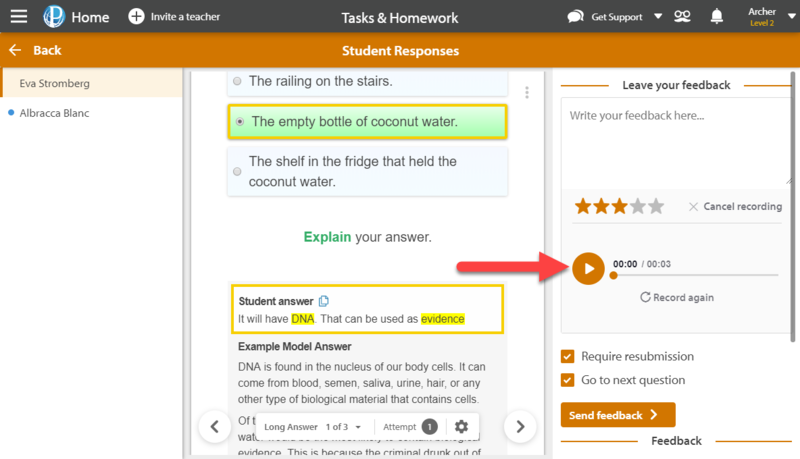 You can switch between them—even while you're on the feedback page—by clicking Display student responses by. If you've assigned the task to multiple classes, you can also filter the answers by class using the Filter by class drop-down menu. Once you're happy with the filters, click on a question or student name to get started. 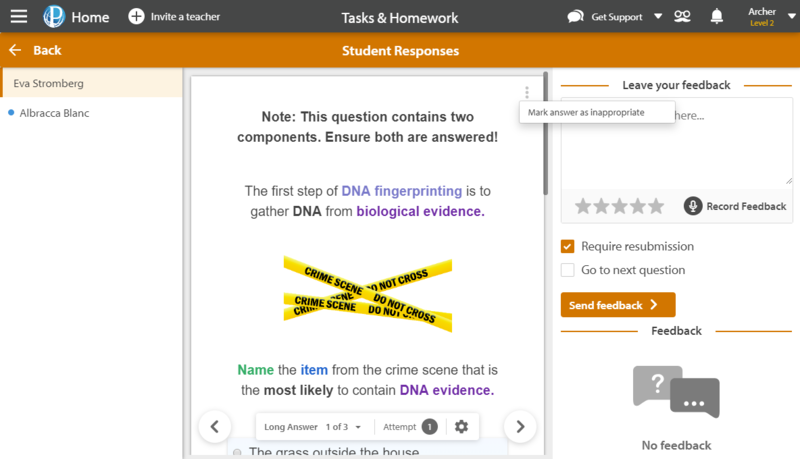 On the left-hand side you will be able to see the names of your students or the questions depending on what option you have selected. The middle section shows the answer for the selected student and question. The third section contains the feedback from you and other students. The comments from the student(s) who reviewed the question are displayed at the bottom of this third section. 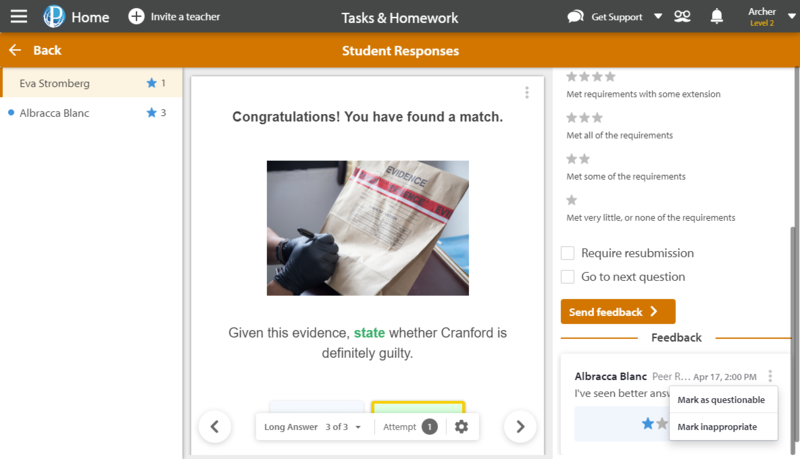 You can leave a comment, give them a star-rating and, if you're not happy with the answer, you can check the Require resubmission box, which will notify the student that they must re-answer the question to complete the task. 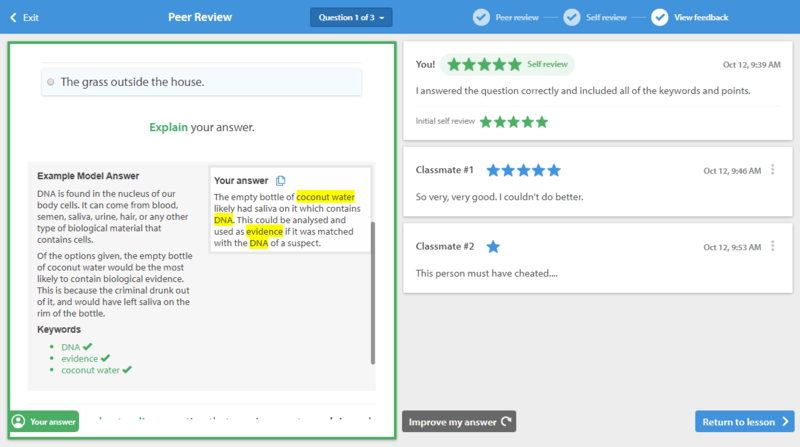 If you're giving feedback to a large volume of answers, you may want to automatically move to the next question once you've posted your feedback. To enable this, check the Go to next question box. Once you are happy with the feedback that you have given, click Send feedback. You are also able to record audio feedback for your students by clicking on the microphone icon. Once you have recorded your feedback, you can play it back by selecting the play button icon. If you are not happy with your recording, you can select Record again. You can see each of the student's names, but everything is done anonymously on the students' end, as pictured below. To deal with any bad responses, you have options for dealing with both answers and feedback that you want to get rid of. You can mark a student's answer as inappropriate by clicking on the other-options menu (three dots) and then Mark answer as inappropriate. Marking answers as inappropriate will remove the answer and require the student to resubmit. For answers that aren't up to standard, you can require resubmission from the check box in the right-hand column. You can either mark feedback as inappropriate or questionable. Inappropriate feedback will be removed and the students will have to resubmit feedback. 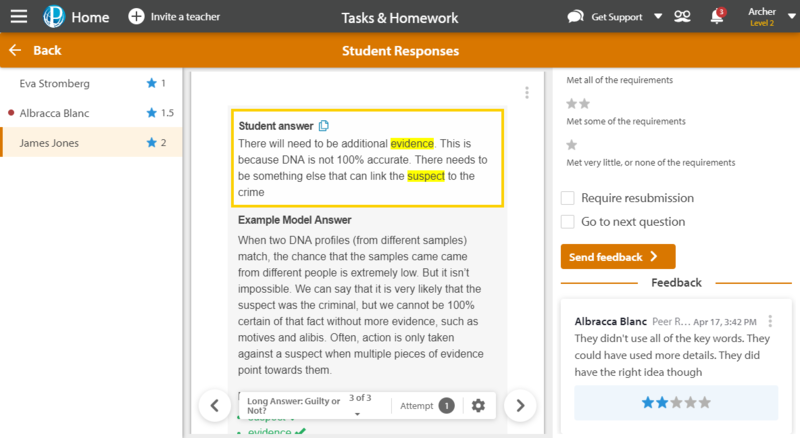 Questionable feedback will be removed, but the student won't be required to resubmit anything—it'll just be hidden from the student who the feedback is aimed at. 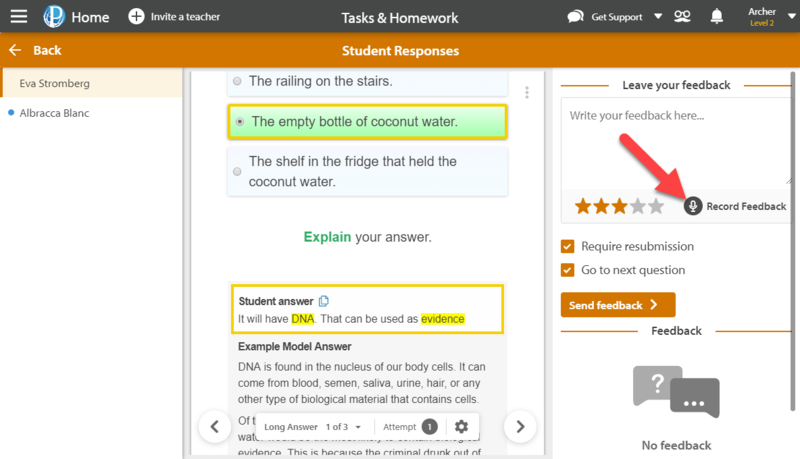 Students are also able to mark answers and reviews as inappropriate or questionable. When this happens, the response will be hidden from the student, and you'll be notified. Reviews that are marked as inappropriate by students will be hidden. If you disagree with this, you can mark the answer as appropriate, so that it's visible again. For low-quality answers, you can require re submission.